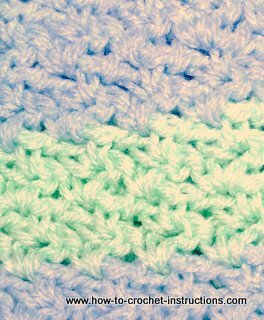 Even a beginner who has mastered these 3 simple stitches could produce this stitch. It produces a thick but light fabric that is very pretty and is especially good for anything you want to have a soft cosy feel such as blankets, jumpers, cardigans or bed jackets. It would also make good scarves and winter hats or snuggly bed socks. Use a size larger hook than you normally would for the thickness of the yarn you are using. The example in the photograph uses double knitting yarn (UK weight) and a 5mm hook. Repeat from * to * all along the row.